One of the best things in life is watching people soar to the sky and fulfill their biggest dreams. But even more than we like watching people succeed, we love seeing their funniest fails – things that basically happen to all of us, all the time. 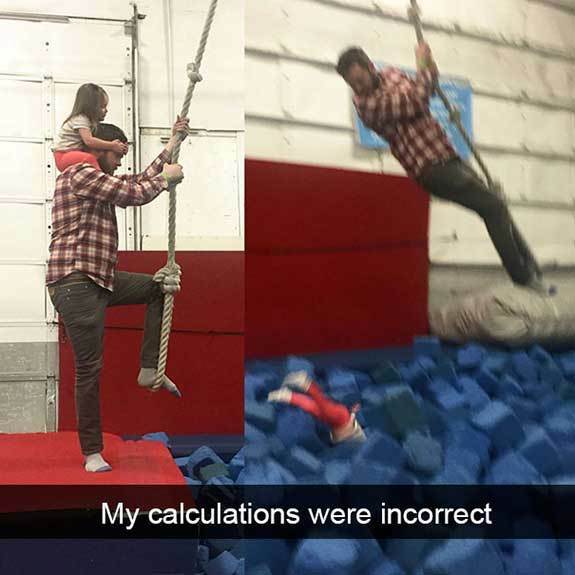 A lot of people share pictures of their funny fails on different places, especially Snapchat. As Snapchat offers the possibility to put up pictures for only a limited time before they’re deleted for good, people often choose uploading their more embarrassing moments through this media. But come on, guys, it’s the internet. If there’s one thing everyone should realize about the internet, is that nothing ever really goes away. Once you’ve uploaded a picture, it stays online forever. But that’s lucky for us, since we get to share them with you now. This person thought they had such a clever idea. We all experienced something like this – you buy something on a vending machine, and it just refuses to come out. Most of us would probably just give up and leave the sandwich inside, but not this person. They decided to buy one of the drinks, located in a strategic place right above the sandwich, thinking it will take the sandwich along with it when it drops down. But you know how the song goes – you can’t always get what you want. 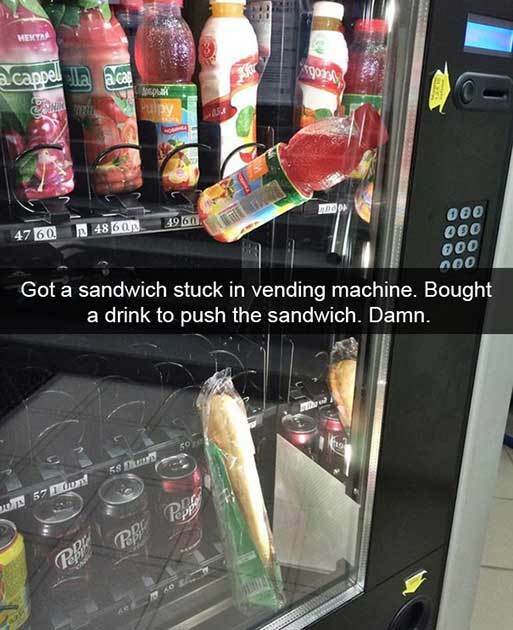 This person probably didn’t expect their drink to get stuck in the vending machine along with their sandwich. Such a waste! 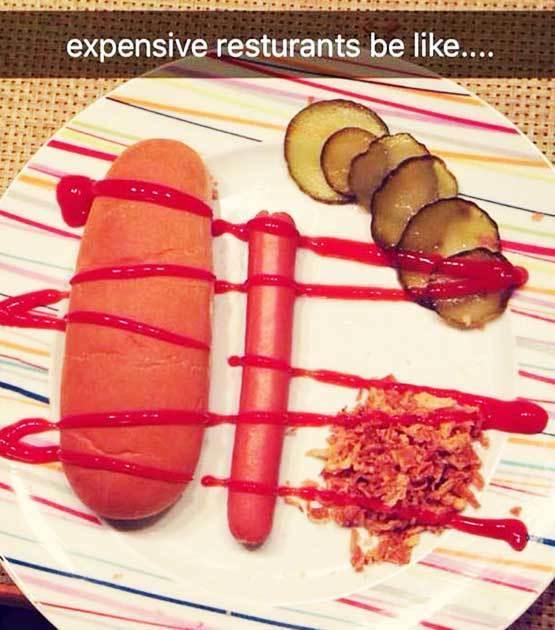 If you’ve ever been to a fancy restaurant, or saw Instagram posts of food that was made into a somewhat pretentious presentation, you’ll totally get what this is about. If the chef of a gourmet restaurant decided to “deconstruct” a hot dog, it would probably look exactly like this plate, with each element carefully put on the plate, with light touches of tomato jeux (not ketchup). All that’s left is sprinkling just a dash of salt on top and there you have it. The only downside to this delicious, luxurious meal is it would probably cost 50 times more than a regular hot dog. But it’s the experience that counts, right? You know those days, when you just feel like having a scoop of ice cream that will melt your problems away (pun intended)? 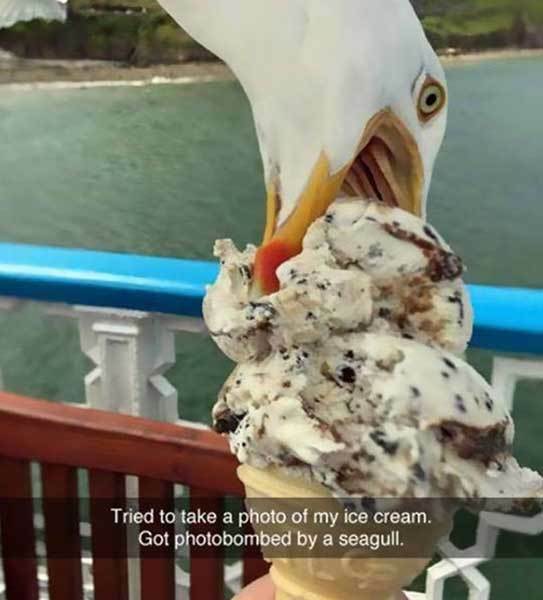 This guy was having a nice day outside, and wanted to snap a photo of his delicious looking ice cream, when an unwanted guest not only photobombed him, but took a bite out of his ice cream! On the positive side – it definitely makes for one incredible picture to put up on social media. 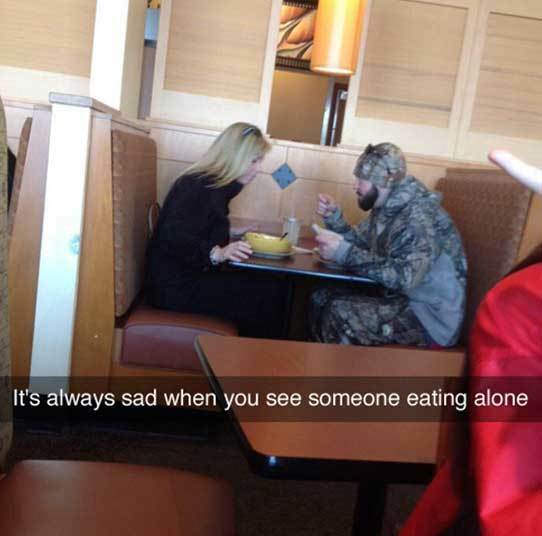 This woman was just sitting alone in a diner, eating her food and minding her own business, when someone decided to take a picture of her and shame her on social media. No, not really. When you get an assignment in school, we feel like it’s a good idea to double check what it’s supposed to be about before you begin. 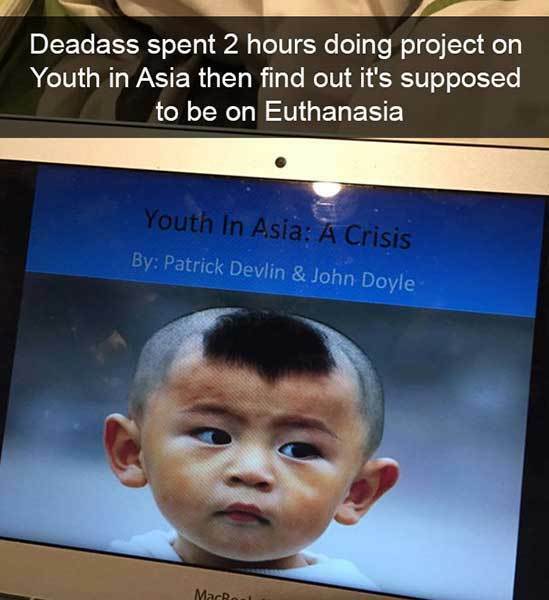 After all, you don’t want to waste two hours working on a paper on the youth in Asia, only to find out it was supposed to be on Euthanasia. But at least these guys learned an important thing or two about the youth in Asia, and a valuable lesson about doing school work. Don’t you just love puns? It’s the kind of humor that, if done right, can be oh so magnificent to come across. We’ve heard really great ones, but this one basically made our day. 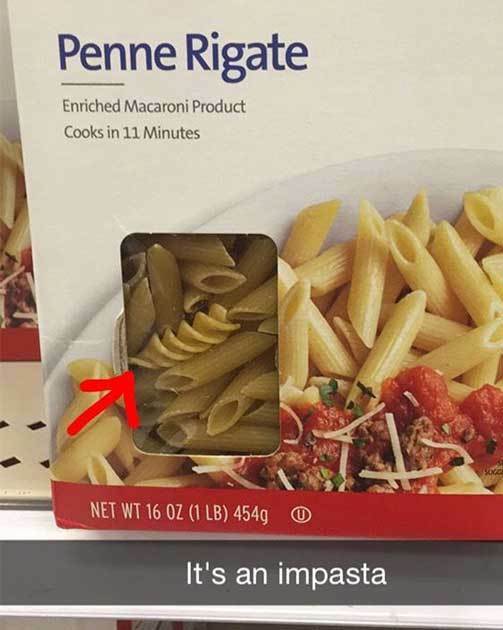 The person who bought this package of Penne Rigate microwave pasta must have a really good sense of humor to come up with this. When he found a fusilli shaped pasta that sneaked into his penne shaped pasta, he couldn’t resist this wonderful pun. This might be the most adorable thing that we’ve ever seen. 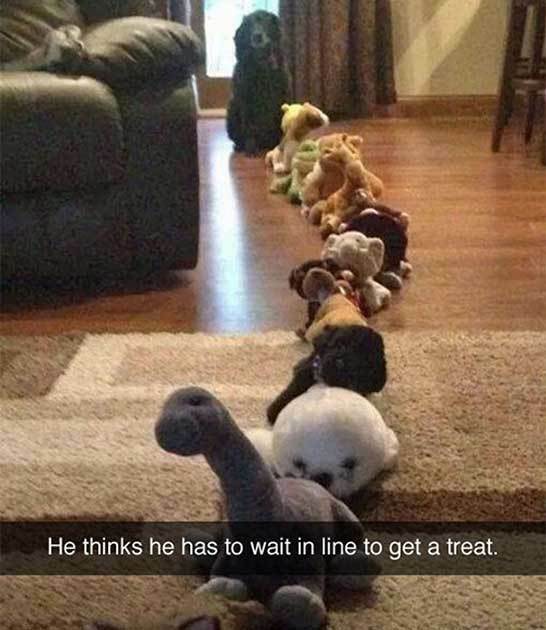 This dog owner thought he’d have a little fun with his dog, and put up a line of over a dozen stuffed animals, so his dog would think he has to wait to get a treat. While it’s a great lesson in the disadvantages of being a human person – that is, having to wait in lines – it seems this line is a so long it’s almost cruel, and for some reason it’s not moving along either! Ahh, Fathers. They can be so much fun when you’re a kid and they carry you around on their shoulders – you feel like you’re on the top of the world, taller than everyone else. Before you judge this person, you should keep in mind not everyone is great at doing their house chores. Sometimes you do the dishes and you accidentally break a plate or two, sometimes you cook something on the stove and start a little fire. It doesn’t come naturally to everyone. 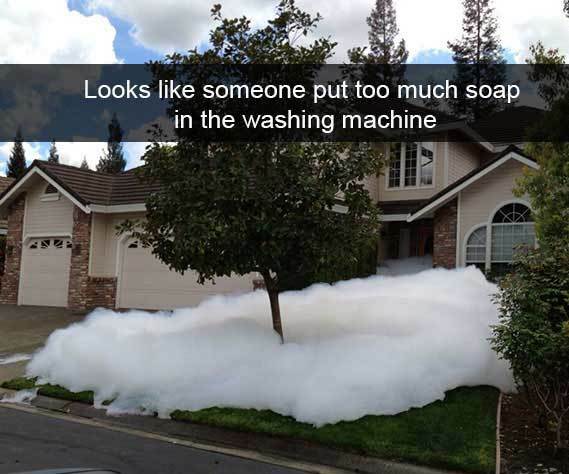 And who can say they’ve never put too much detergent in the washing machine, really? Granted, the person who did this took messing up chores further than any man has before. Roomba vacuums can be so helpful sometimes. When you come home at the end of the day, you just want to kick back on the couch, put your legs up on the table, and let a little robotic vacuum do all the work for you. It’s even more helpful if you have a pet, because we all know pet hair can get everywhere. 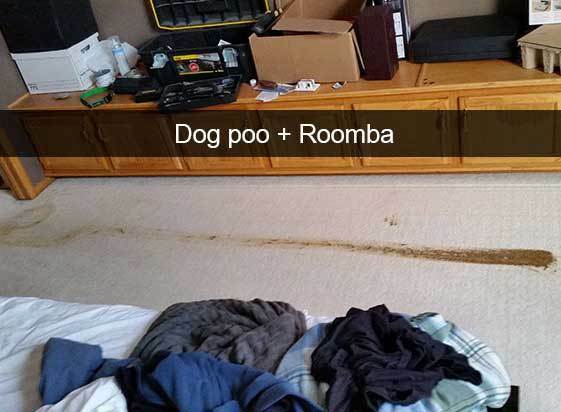 But watch out – if your pet does their business on the floor, you may not want to use your Roomba to clean it up. Teachers have a really important job, when you think about it. They basically teach us everything we know, and as kids we don’t always necessarily pay attention to the teacher in class. 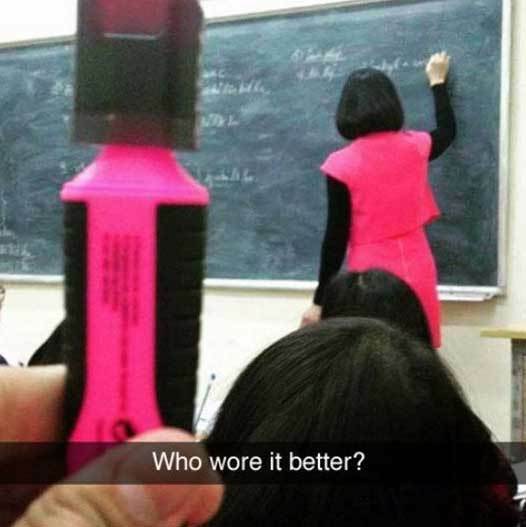 But it’s hard to blame the kid who took this picture – it’s not his fault his teacher happened to dress exactly like a highlighter pen. With the combination of hot pink and black, even her hair looks like the cap. And to think there was a time when we didn’t have camera phones to documents these fine moments in life. Sometimes, when you work in an office, you have to be mindful to what might be annoying to the people you work with. 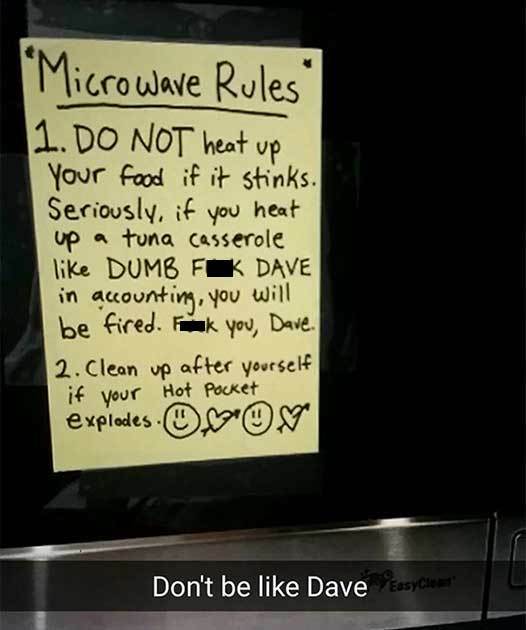 For example, if you heat up a tuna casserole in the microwave and create a potent aroma that takes over the entire office space, don’t be surprised you’ve cheesed people off. In fact, don’t be surprised to come into work one day and find a sign like this one in the kitchen. That being said, the person who wrote this may have some underlying anger issues. We get it. You go through all this trouble – you look up a recipe online, you go out and buy all of the ingredients, spend time and effort following the recipe to a tee. You just want your dish to be something special that your friends or family will love to eat. Maybe you’re trying to impress someone you like. 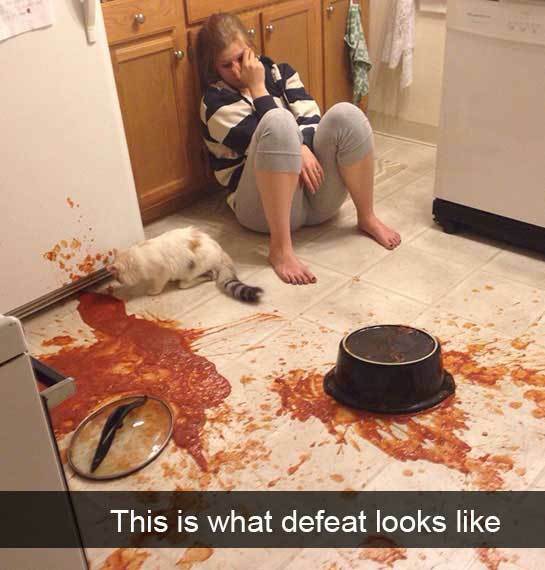 But then you pick it up, and everything spills all over the floor, not only spoiling your dish, but also making a giant mess. We would’ve given up too, girl. Have you ever heard the saying “cuts like a knife through butter”? The point being, cutting with a knife through butter should be fairly easy. What it shouldn’t do, is break the handle of a perfectly good bread knife. 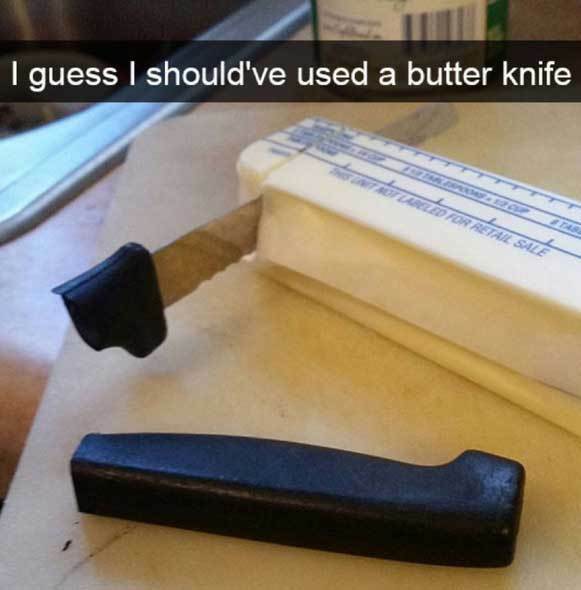 You have to be pretty unlucky to get this to happen while cutting through butter. Either that, or the butter was actually freezing – in which case this person should’ve probably heated the knife before cutting through. Ah, to be young and in love. There aren’t many things that are quite as thrilling as being proposed to, or proposing marriage to someone. Sparks are flying, and when the answer is yes – everyone around the couple rejoice. 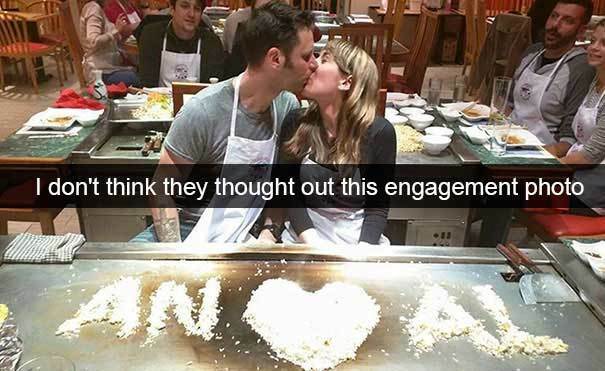 We can only assume these two lovebirds were in such a high after getting engaged, they didn’t even notice the unfortunate word spelled by the combination of their initials. But when true love like theirs is in the air, who cares, right? We honestly feel so bad for this person. 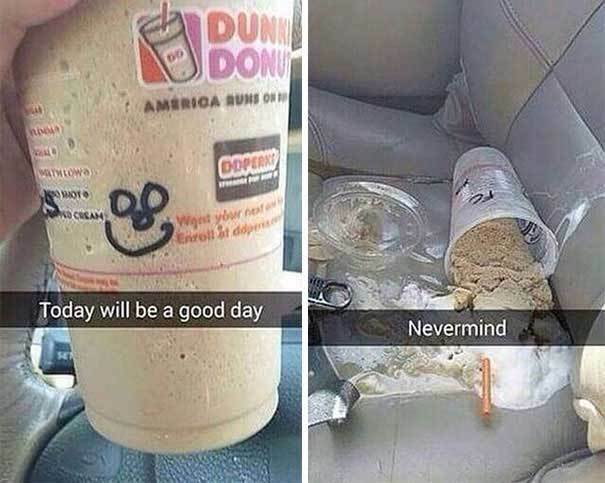 They got a nice, big, delicious blended iced coffee from Dunkin’ Donuts, and they even got a smiley face drawn on their cup. They thought the day was going to turn out great, but it took a turn for the worse when the coffee spilled all over their car seat. It’s bad enough to lose the coffee, but having it spilled and having to clean up all that mess… that’s just despairing. If you’ve ever watched the Pixar hit animation movie Finding Nemo, and its sequel, Finding Dory – then you probably know Dory as the quirky, happy-go-lucky, lovable fish who suffers from short-term memory loss. 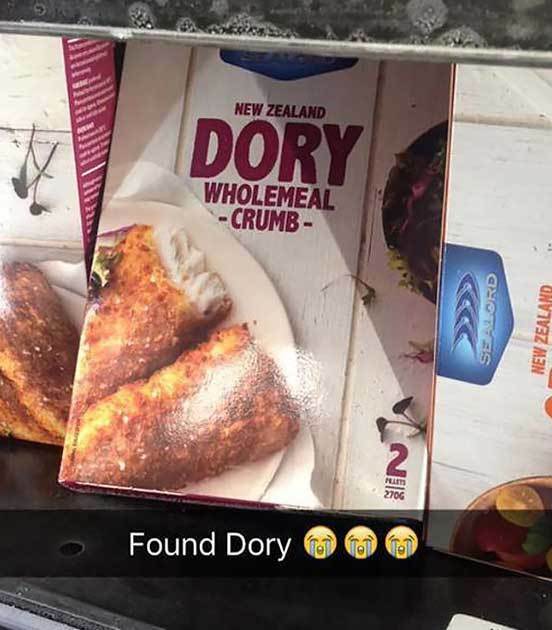 Dory might’ve gotten lost in the latter movie, but we never expected to find her like this. Coated in breadcrumbs and fried. Well, it actually sounds pretty delicious to us, but we wouldn’t give this to any kid who knows how to read. Unicorns are magical creatures, rare and beautiful and oh-so-colorful. They’re also totally in trend right now, and not just with children, there’s even unicorn makeup nowadays – because who doesn’t love unicorns? 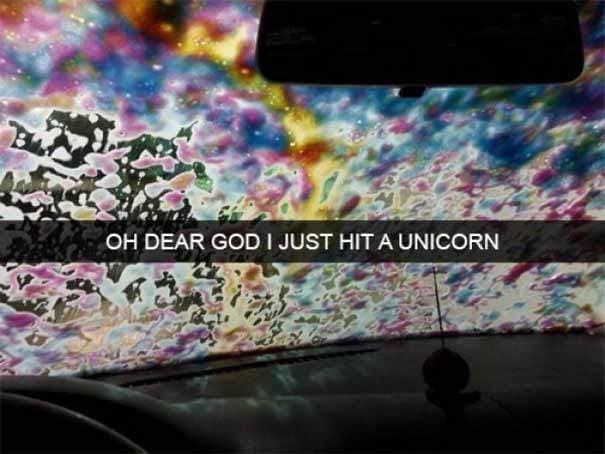 You have to be a really terrible person to run over a unicorn, since they’re all but extinct! But kidding aside, this is the prettiest car wash soap we’ve ever seen (at least we assume that’s what we’re looking at), and the caption is pretty hilarious. 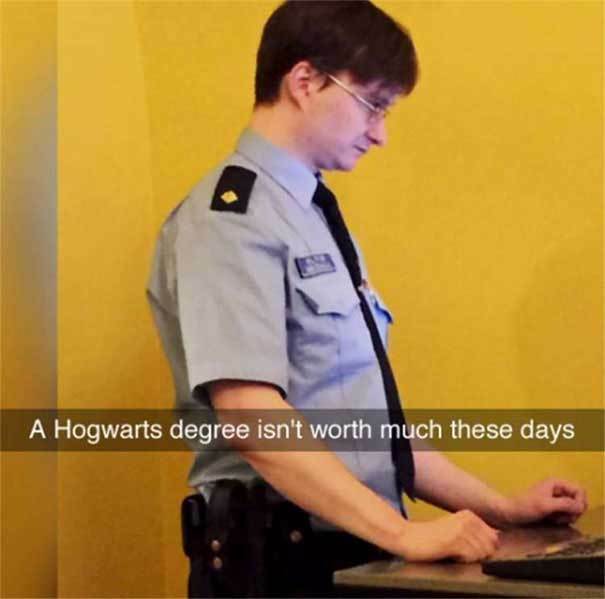 This security guard actually does look a lot like Daniel Radcliffe, but wouldn’t it be funny if Harry Potter was working as a security guard. It’s pretty sad to see “the boy who lived” didn’t make his dream of becoming an Auror come true. Or maybe he actually did, and he’s there undercover, pretending to be a Muggle in order to catch some dark wizard trying to sneak into his place of work. Yes, that must be it. We’re starting to think the person who put too much detergent in their washing machine wasn’t that bad at laundry after all. 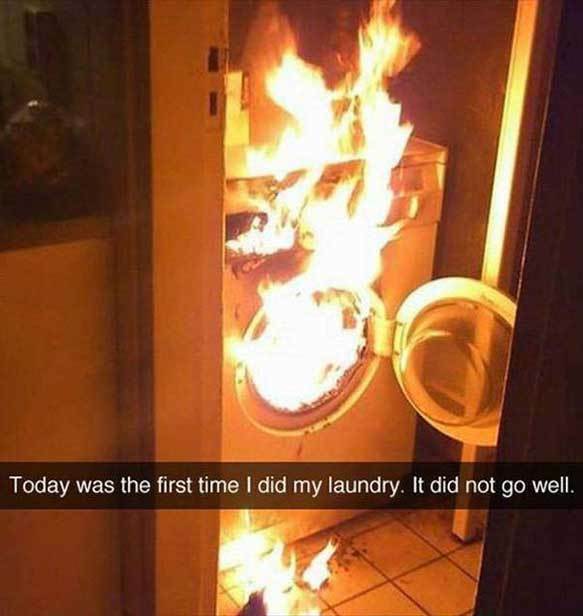 We honestly don’t even know what it requires for a washing machine to suddenly burst into flames like what happened in this picture. We’re just hoping this person put down their phone and actually took action to put out the fire, because it looks pretty serious. Next time maybe just go to the dry cleaners. 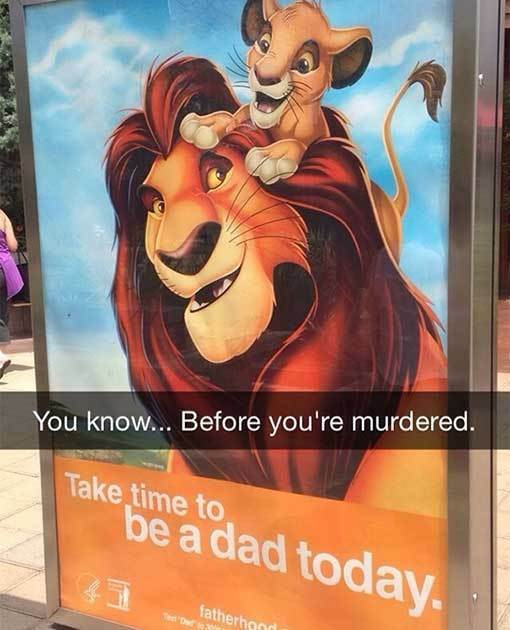 Whoever came up with this sign has either never actually watched The Lion King, or has a pretty twisted sense of humor. Yes, Mufasa was an awesome lion-dad, but everyone knows that his tragic death is one of the saddest moments in the history of film. Its only parallel is the death of Bambi’s mother. So remember to be a good dad, guys, before you fall off a cliff into a herd of wildebeest, we guess. It’s always nice when your place of work appreciates their employees, giving them little perks every once in a while. 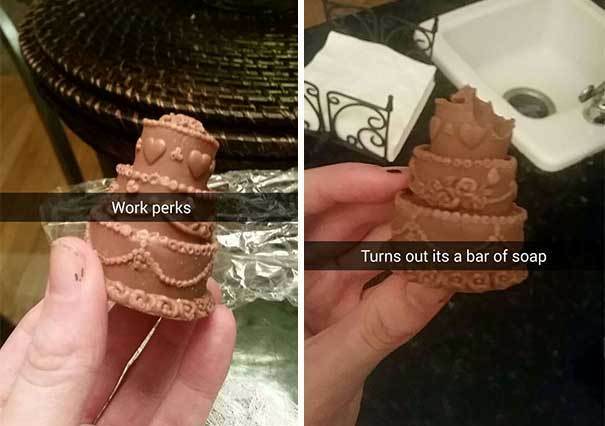 And, let’s admit it, we all want these perks to be food related, because nothing beats the daily routine of work like a delicious cupcake with frosting, right? This guy thought he was getting just that, and we can only imagine how disappointed he was when he took a bite out of what turned out to be soap. We feel your pain, man. This is one of the most depressing things that can happen to a person. You get up in the morning, stand in front of the mirror and pick out the perfect outfit for the day, wanting to look as great and as fashionable as you can. 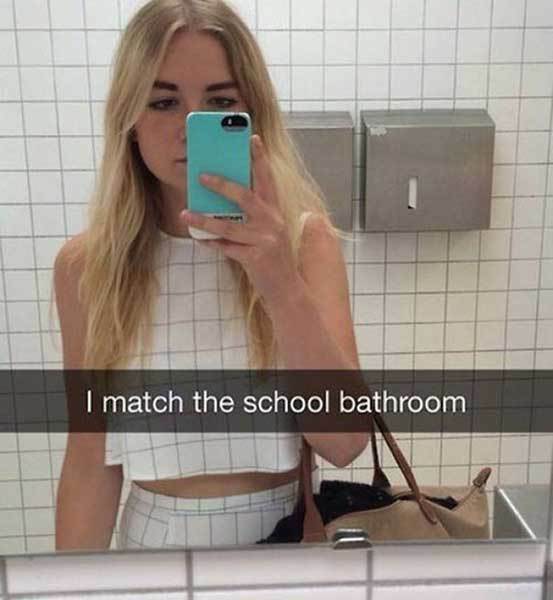 And then you get to school, go to the bathroom, and find out that the perfect outfit you picked out for yourself matches the tiles of a school bathroom. Not great. This photo requires a few moments of looking at it to understand what’s going on. If you were driving right behind it, you would probably freak out for a second before you realized it’s not a man in a van going in reverse, but a set of seriously awesome stickers that make this van’s rear side look like the front. 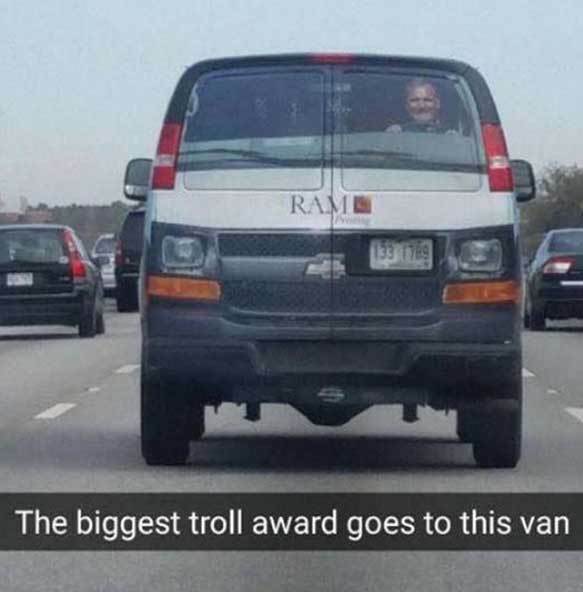 The person who wrote the caption had it right – that’s one hilarious way of trolling people on the road. When you take your dog on a walk, you should probably pay attention to what your dog is doing. We sure hope this dog can swim, because their owner is too distracted to even notice that his dog fell into the water! 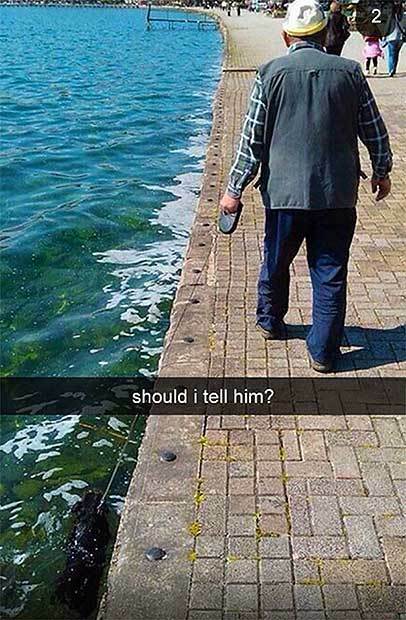 And the person who took this picture isn’t innocent in all this either, since he chose to take the picture instead of letting the owner know that his dog fell off the pavement into the water. Nice job, people.